At Smile Creation, we’re committed to providing safe, gentle and high-quality dental treatments. We believe that prevention is the best way to avoid future dental problems and offer options to maintain your oral health or to immediately address any issues you may be having. If you’re experiencing tooth decay, we can catch these problems early so that the required filling can be smaller with less invasive treatment needed. We offer mercury-free composite fillings that blend in perfectly with the colour of your other teeth. Halitosis, also known as bad breath, is an issue commonly experienced by many. It can damage your self-confidence and feel embarrassing and must be dealt with. At Smile Creation, we’ll teach you the proper oral hygiene habits that can reduce or even eliminate this worry. Regular checkups are essential to minimising bad breath. If your gums are inflamed or bleed from brushing and flossing, it may be an early sign of gum disease. Left untreated, the bacteria on your teeth will spread and cause decay, infection or bone loss. It’s easily preventable with regular checkup and cleans. We’ll also advise you on what to do if gum disease is present. 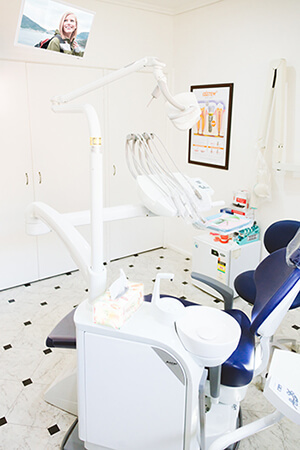 We understand that some people may feel apprehensive when thinking about going to the dentist. Our caring team will fully explain what you can expect before proceeding. If you’d like, we can offer you laughing gas that will help you relax. With a television mounted in the ceiling and headphones available, you can rest easy knowing you’re in great hands. Your smile can last a lifetime if properly cared for with a proactive approach. We offer several different preventative dentistry services. Your teeth, gums and surrounding structures will be thoroughly evaluated. If further treatment is required, we’ll discuss your options with you. To see between your teeth and under the gums, dental X-rays may be taken. These images enable us to detect decay, abscesses or periodontal (gum) disease. Tartar and surface stains are gently removed with a comprehensive cleaning. Your mouth will be left feeling clean with dentition that’s easier to maintain with your regular home care habits. Each treatment plan at our clinic is tailored to the individual’s concerns and needs. We’ll perform a thorough examination to evaluate your needs, then go over all possible treatments with you. Contact us today to learn more about our services! We’re in-network providers for many health funds and process your rebate immediately with HICAPS.